The JOHN DEERE EXACTEMERGE™ PLANTER ExactEmerge meter uses an industry-exclusive bowl-shaped meter to singulate seed. This concave design shape allows more seed pool engagement with the seed bowl than ever before. This allows the vacuum to run between 35.6 cm to 45.7 cm (14 to 18 in.) of water to plant most corn sizes. This newly designed seed bowl also allows high operating speeds without compromising singulation. Producers easily achieve 100 percent population by only needing to make vacuum adjustments, making it a true pour and plant meter. Deliver more than 99 percent singulation in corn and for the first time, singulate soybeans. 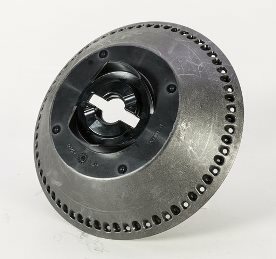 Another advantage to the bowl-shaped design of the seed disk is the controlled handoff from the disk to the JOHN DEERE EXACTEMERGE™ PLANTER BrushBelt™ delivery system. 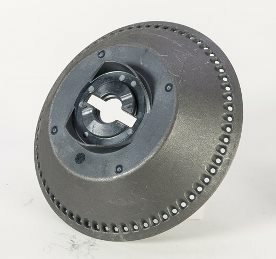 Having a flat disk prevents the seed from accurately being placed into the center of the JOHN DEERE EXACTEMERGE™ PLANTER BrushBelt. The seed bowl has a traditional vacuum holding the seed on the hole and aggressive paddles following the seed. When the seed gets to the BrushBelt it needs to do a handoff. The seed paddle pushes the seed into the brush to ensure that each seed is easily and gently grabbed by the JOHN DEERE EXACTEMERGE™ PLANTER BrushBelt to complete the perfect handoff and maintain the seed spacing from the bowl. There is a seed guide at the top of the meter to place the seeds in the center of the BrushBelt, which is very important for depth control. Running the seed over the top of the belt eliminates any uncontrolled drop off the seed disk.